Like most years, 1986 ended with Guru and many of the local disciples going away on vacation. Though I didn't get to go, it had been a good year. Before leaving, Guru gave what was becoming a standard talk on how he hoped that no disciples "disappeared" while he was away. Though the idea hadn't yet occurred to me, there was a bit of the "while the cat is away, the mice will play" attitude amongst some of the local disciples. Rules were broken in Guru's absence. Usually, a few would take the further step of leaving the Center. I sort of enjoyed the solitude. I'd do my regular work hours at the Smile and then go for a run in the cold, dark early evenings. After dinner, I'd walk over to Ketan's place -- a granny flat behind his parents' house. Ketan was away on the trip, but he had generously given me his key so that I could go in and watch TV. When Guru returned in mid-January, the pace quickened again. Before leaving for the trip, Guru had told me to start apprenticing with another disciple to learn how to operate the Center's old Heidelberg offset press -- the one used to print all of Guru's books. 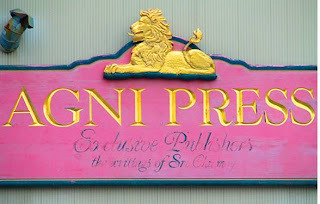 My press night was Thursday, so shortly after their return that January, I headed over to Agni Press. I was apprenticing with Abedan. Abedan was a long-time local disciple who cultivated the appearance of a brusque personality. He founded and ran what was, arguably, the most successful disciple-run enterprise: Victory Factory. Shortly after I got to the press that January night, however, someone from Guru's house called. "You're wanted up at the house, Yogaloy." I felt sheepish leaving the press so soon after I had arrived, but I was only there because Guru wanted me there. And now, apparently, Guru wanted me at the house. So, my misgivings didn't last long. When I got to the house, the first thing I noticed was that there were a lot of guys there -- more than normal. Clearly, something unusual was going on.